In anticipation of the International Sports Day, we are glad to introduce you Champion Runner app. Help our champion to prepare for the International Sports Competition! Your goal is to train him well – jump over all the barriers on his way and collect sweet bonuses. 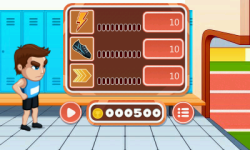 Collect the bonuses and make him run faster and increase his health. He has a lot of barriers and rings on the way, so be careful and over jump them all. Train the Champion and help him win the International Sports Competition. Champion Runner special features: - collect different bonuses and increase you chances to win - jump over different barriers on your way - don't miss your lives and pay attention - improve your runner characteristics – speed, endurance, acceleration - you have up to 10 levels to update your Champion Runner.